Life is sometimes unfair and that’s really unfair. 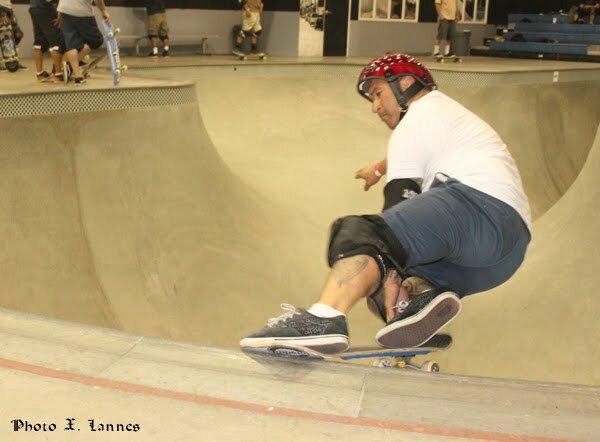 Just minutes after finishing recording the ever postponed interview with Kiko Francisco, I took my board and plunged several times into the combi pool, ready for another radical night sesh at Vans. After a couple of runs, I though it was time to wrap up and end the night (it was almost 10pm) with a “last run”. Little did I know that it would be the last run … for the next several months. After dropping and flowing through the square pool at full speed, I lost balance at the bottom of the bowl and literally crashed in the huge wall in front of me with my left arm upfront. The violence of the impact made me immediately tremble and bounce back into the pool, like a disband mannequin, and there I laid for what looked like a minute or so, holding my left wrist until Lonny Hiramoto and Ozzie Ausband jumped into the combi, came running to my rescue and performed a rapid audit to discover that, even if I was totally groggy, I was still alive and apparently OK and eventually comforted me. It was like a bad dream. I woke up and felt like if I was in a haze, surrounded by some unfriendly and sour substance. Lonny did not stop asking me the same thing over and over; “Xavier, are you OK? Xavier, are you OK?”. I could not understand his insistence because, hey, I really thought I was Ok, so I kept on saying: “I’m OK, I’m OK”, because, frankly, man, I though I was OK.
After Ozzie and Lonny helped me get up on my feet, I ran up the transitions, hopped the small wall at the middle of the combi, sat on the bench in front of the pool, and removed my wrist guard. In lieu of the wrist, there was a big white hollow and on top of my hand had landed a hard and huge bump, the size of two thumbs. I was so in denial that it did not even hurt. Lonny made me lay on the bench and started auscultating me. It was only after a couple of minutes that I realized how hard it was for Lonny to tell me the truth, but he finally repeated several times in his signature mellow tone: “Xavier, you badly broke your wrist, sorry for the bad news”. I was shrouded in anger and denial. I though that breaking a wrist at the bottom of the combi was the most stupid thing a skater could do. Worse, I suddenly realized that if my wrist was broken I would not be able to skate for that next couple of months. I was haunted by the idea of a daunting doctor lifting his menacing finger at me and telling me in a hollow voice that I could never skate again. Life is not worth a kickturn if you have to stay for ever in front of a pool watching the others grind noisily and effortlessly! 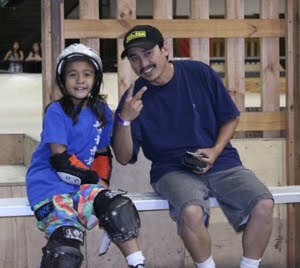 So while Lonny was trying to comfort me by saying that he would pray for my quick recovery, I packed my knee pads, elbow pads, wrist guards, legal pad and helmet, took my recorder, my cameras, stuffed them all in my backpack, jumped on my skate until the Vans exit door and finally drove back home in my old Chevy. Eight days after, I was at the hospital ready for a 1h1/2 surgery. May the Lord bless Lonny: it was only after 16 days after the crash that I was finally able to type again, my left wrist surrounded with metal plates and pins and my right wrist still sore from the impact (but not broken). Now, look Ma’, I can type with both hands! And Kiko? Well, by the time I crashed into the wall, he had gone back home unconscious of what had happened. What a way to start an interview right? Actually, this is not the introduction to Kiko’s interview, but some kind of fair preamble, just to warn you… Kiko Francisco’s interview will be rad but only be ready in a couple of days because, even if I can type with both hands I’m still not the master of the keyboard (and the shortboard) I used to be. Breaking up is hard to do but healing is fast, talk is cheap and the sky is the limit! So, when is the next sesh? Pronto! 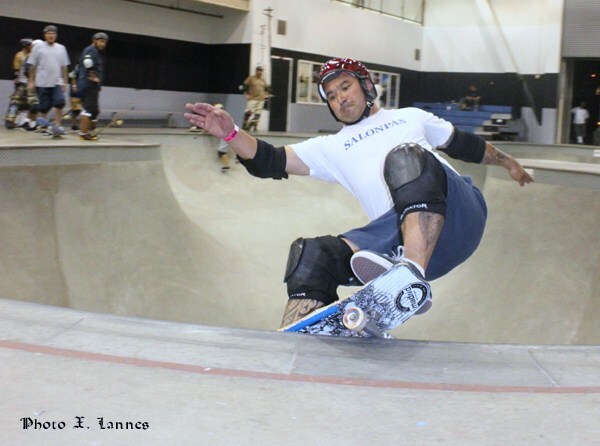 I already picture myself in full protection gear, elated and dropping from … the mini bowl of the Anaheim-north skatepark. What would life be without pain, casts, metal plates, unfairness and mini bowls? You got it: Plain Boring! Photos: X. Lannes, MRZ. Thanks to Lonny and Ozzie! I owe you one! The Dew Tour is back. Ubu Roi: the prémisses of skateboarding?